Your smartphone allows you to get almost instantaneous answers to the most obscure questions. It also allows you to waste hours scrolling through Facebook or looking for the latest deals on Amazon. But for several years, economists have asked why all that technical wizardry seems to be having so little impact on the economy. The issue surfaced again recently, when the government reported disappointingly slow growth and continuing stagnation in productivity. The rate of productivity growth from 2011 to 2015 was the slowest since the five-year period ending in 1982. The productivity puzzle has given rise to a number of explanations in recent years — and divided economists into technology pessimists and optimists. But an industry-by-industry analysis, published by the McKinsey Global Institute, the research arm of the consulting firm McKinsey & Company, found that the march of digital technology across the economy has a long way to go. The McKinsey researchers examined 22 industries, measuring not only investment but also the use of technology to change how work is done. Some industries, like technology, media and financial services, were well along, while others, like health care and hospitality, trailed. Since the financial crisis, the Obama administration has moved aggressively to push medicine into the digital age. As part of the economic recovery package, Congress enacted the Health Information Technology for Economic and Clinical Health Act of 2009. The legislation provided for federal incentive payments of $44,000 a physician to shift to electronic health records. The billions of dollars in subsidies were intended to accelerate adoption. And from 2008 to 2014, the share of hospitals with electronic health records rose to 75 percent from 9 percent, while the adoption rate in doctors’ offices rose to 51 percent from 17 percent, according to the most recent surveys by the American Hospital Association and the government. The government incentives came with timetables for adopting different levels of use and new reporting requirements, with the prospect of financial penalties for doctors and hospitals that fell behind. The early goals for adopting electronic records were reasonable, health experts say, but the later stages were too aggressive. Overwhelmed doctors protested, and the administration recently shelved the previous timetable, stretching out schedules and modifying some reporting rules. 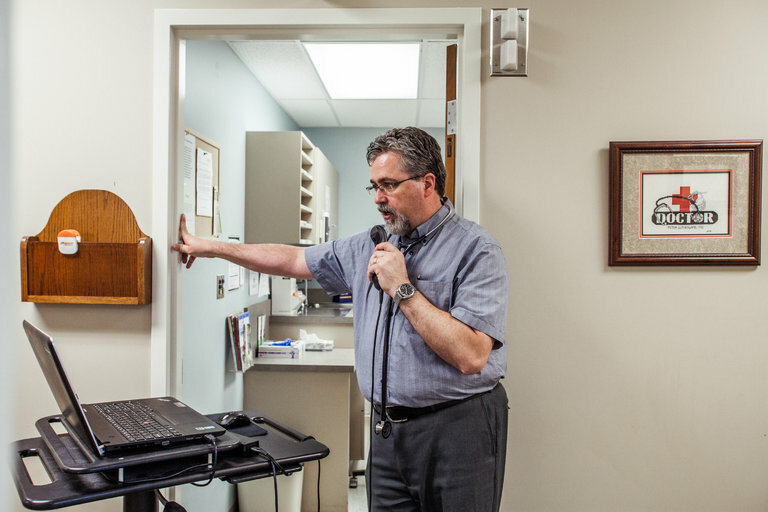 Healthstar Physicians, the 50-doctor group in Morristown, Tenn., where Dr. Sutherland practices, was spurred to go electronic by those federal incentive payments, which now total $32 billion. But the cultural adjustment to digital technology has been challenging. Dr. Sutherland and his colleagues evaluated several technology providers and chose Athenahealth, which does not sell software but is paid a percentage of its customers’ revenue. Healthstar started using Athenahealth’s cloud software in 2012, first for billing and then for electronic health records. Athenahealth’s share is less than 5 percent of the group’s revenue. Today, Dr. Sutherland’s personal income and the medical group’s revenue are about 8 percent below where they were four years ago. But in 2015, both his earnings and the revenue of Healthstar, which employs 350 people in 10 clinics, increased slightly, by nearly 3 percent from 2014. Dr. Sutherland decided he did not want a computer screen separating him from his patients. So he opted for a tablet computer, making it easier to keep eye contact. Not a fast typist, Dr. Sutherland decided to use voice recognition software. For six months, he stayed up until midnight most nights, training the software until its speech recognition engine could transcribe his comments into text with few mistakes. Dr. Sutherland bemoans the countless data fields he must fill in to comply with government-mandated reporting rules, and he concedes that some of his colleagues hate using digital records. Yet Dr. Sutherland is no hater. 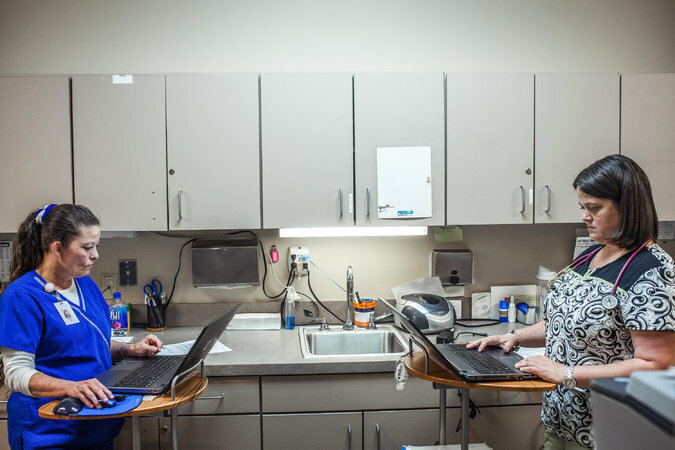 Despite the extra work the new technology has created and even though it has not yet had the expected financial payoff, he thinks it has helped him provide better information to patients. He values being able to tap the screen to look up potentially harmful drug interactions and to teach patients during visits. He can, for example, quickly create charts to show diabetes patients how they are progressing with treatment plans, managing blood glucose levels and weight loss.